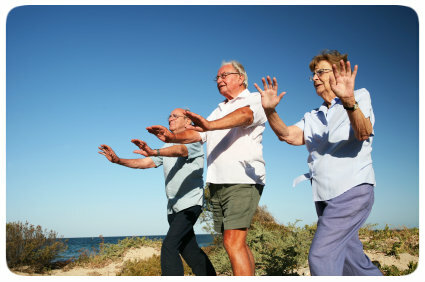 If you are interested specifically in Qi Gong, we have a dedicated site at www.qigongforvitality.com. Please visit us there, and sign up for our newsletter and we will send you info on new videos and courses! Through the practice of Qi Gong one can feel full of life, age gracefully and reduce stress. In ancient China there was a practice called Qi Gong, pronounced “chee gung” that was taught to build the energy, strength, and life force of a person. It was originally developed by a monk from India named Da Mo (Bhoddhi Darma). When Da Mo came to China he saw the terrible state of health the monks at a Buddhist temple were in while they were trying to meditate. He saw that they were sick, weak, overweight, tired and lacked concentration. He taught the monks simple Qi Gong exercises and within a short time their health and energy improved dramatically and they were able to continue their spiritual work. Since then Qi Gong has been practiced throughout China, Japan, Taiwan and Asia. Asia’s greatest leaders have hired Qi Gong masters to teach them how to live and age gracefully. It has evolved in some ways but has retained most of the original teachings and form. Qi Gong, also known as Chi Kung, is literally translated as “energy work.” Qi is translated as “energy.” Gong is translated as “work.” Traditional Chinese Medicine (TCM) believes that all illness and disease is a result of blockages of energy or qi in the body. As these blockages get worse they start to ‘stagnate’ the blood and the flow of energy. As the energy and blood stops flowing smoothly it starts creating symptoms of disease. These symptoms can be fatigue, pain, headaches, irritability, weight gain, stress, hypertension and digestive disorders. Blockages in energy flow can be moved through Qi Gong, acupuncture, exercise, and meditation. There are many different styles of Qi Gong. Some are considered ‘soft’ while others are ‘hard.’ Soft Qi Gong is considered to be gentle on the body, easy on the joints, good for circulation, and overall health. Hard Qi Gong is used to strengthen the body in order to increase one’s martial arts ability. Hard Qi Gong can lead to impressive ‘mind over matter’ displays of physical power, and resistance to injury from physical trauma. While these displays are often amazing to see, ‘hard’ Qi Gong can be harmful to the body if not practiced correctly with careful guidance. When one practices ‘soft’ Qi Gong they attain the most health benefits with the least amount of strain on the body. Jeff practices and teaches a form of ‘soft’ Qi Gong which is gentle and suitable for all abilities. Jeff practices and teaches a style of Qi Gong developed specifically for the average person. It is not necessary to have a high level of physical fitness to do the exercises as they are gentle and focus on improving energy and breath work. The routines are suitable for seniors and those who are interested in improving their health. You do not need any previous training, athletic ability or special equipment. The exercises involve stretching, slow movements and powerful breathing techniques. Much of the form can even be practiced by those with mobility challenges.